In a concert that gospel singer Nkosi Ka Ndlovu has themed 10 years in His service, he comes to us with a brand new eight track album called My Praise. Some of the songs are Ndlovu's original compositions while others are traditional hymns rearranged with Nkosi's trademark signature of making sure the songs keep the African flavour in them. This album is certain to bless every soul. "At our 28th October 2017 concert I'll be singing no less than four songs from the new album which will also be on sale for people to play in their cars on their way back home" an ecstatic Nkosi ka Ndlovu said. Nkosi Ka Ndlovu & his backing band The Experience have promised an epic and thrilling performance. "I have been attending Nkosi Ka Ndlovu's concerts over the years and in every concert I have come out a new person, his performances are a marvel to watch, I can't miss this one for anything" saying Njabulo Sithole, who clearly is a satisfied fan and supporter. Songs to look out for in this sizzling album are INyang' enkulu (The Great Physician). Thula Moya Wami (Be still my soul) and Blessings are flowing. 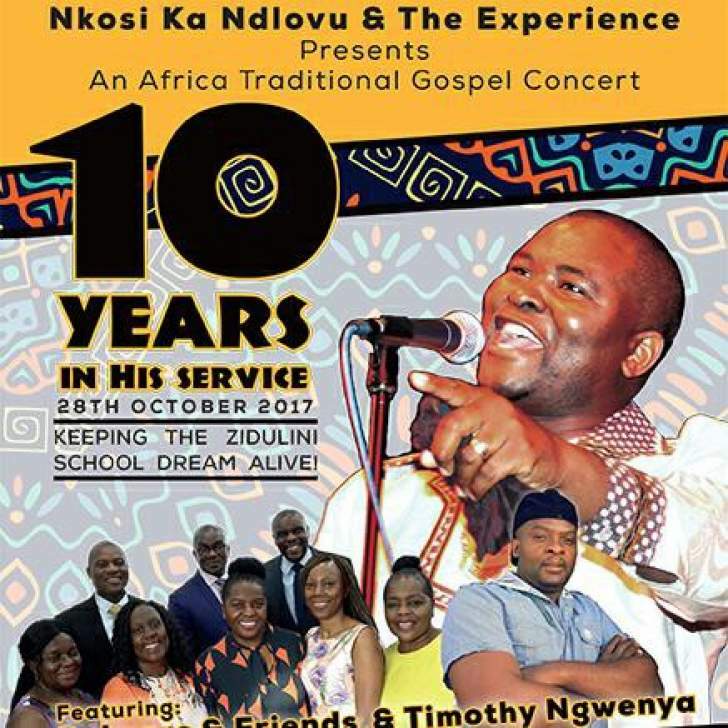 The concert is also in aid of Nkosi's former school Zidulini in Nkayi Zimbabwe. Through these proceeds from these concerts a students classroom block was completed in 2015. Nkosi ka Ndlovu's efforts are also supporting with school fees for two orphaned kids. At the moment resources and cash are being collected in order to help build another block. Those willing to donate towards fees for the kids can contact Nkosi on +447799140511 who'll facilitate with details of Hlangabeza high school's bank account for transparency and peace of mind on the part of the donor. "People have always given me tremendous support in all my concerts since the start of this ministry in 2007 and I'm ever so grateful. Some have driven to our concerts from as far as London and Scotland. Thank you and once again I promise my best on the 28th" a humble and grateful Nkosi ka Ndlovu said and continued "To the Pastors and elders who've helped with the sales of our advance tickets, God bless you. Thanks again to friends of Zidulini some of which contribute monthly towards fees for those unfortunate kids I say to you Zidulini school dream lives on because of you" said Mr Ndlovu. The other artists on the concert would be the talented Palmer family called Palmers and Friends as well as the vibrant brother Timothy Ngwenya. "In keeping with our tradition and custom, we will start on time, 7pm sharp and finish as well on time 10pm. There are three big car parks around Bilston Town Hall" said Mr Ndlovu (people will get details as they buy tickets). "Still on Zidulini, I am glad to announce that we have taken the dream and vision even higher. On 27th May 2017 we met in Wolverhampton as all Nkayians based in the UK (126 of us, though I believe we are more than that) and resolved that instead of doing small projects as individuals around Nkayi that we combine efforts and do bigger projects" announced Mr Ndlovu. The group has agreed on setting up monthly standing orders as means of raising funds for what they have called Nkayi Development Initiative. The idea is not to only help Zidulini this time but ALL schools, hospitals and clinics in their beloved district of Nkayi. "I must say that we are raising substantial amounts of money monthly and all salute goes to the humble people of Nkayi who said yes to my plea and call" Mr Ndlovu humbly submitted his gratitude. With the funds raised raised the group hopes to send at least two containers of books, all learning /teaching materials as well as hospital equipments per year to Nkayi. They also hope to rebuild dams and boreholes so that in the next five years Nkayi will have income generating projects in the form of irrigation schemes, cattle ranching and fishing just to name a few. Ultimately, they hope to solicit for funding from all Zimbabweans both at home and in the diaspora in order to construct the long-spoken-about Byo-Nkayi road. "We believe that once people have seen what we would have achieved in helping our schools hospitals and water on our own that then they will be willing to help us to construct our road. I humbly call upon all Nkayians (and any well wisher to contact me and make their donations to this grand plan). Yes on the 27th May meeting we agreed on big sums but let me hasten to say that people are free to give what they can afford" concluded the ever so humble yet so visionary musician. Mr Ndlovu extends a special invite to everybody, the young and old, those who will be coming for the first time and those who have attended the concerts before to come in their big numbers. It is people like Nkosi ka Ndlovu who bring delopment in communities who needed to be supported. Even if people may be not in a position to attend they phone Mr Ndlovu and make donations. As a people we need to support such missions in order to transform in our communities. All we can say to Mr Ndlovu is to encourage him to trudge on regardless and we say thank you Thole leNdlovu.